I’m doing a Mermay Colouring Book Kickstarter Launch! The 31 designs in this book are all pieces I created for the drawing challenge Mermay. Last year, a similar month-long challenge got me out of a really bad drawing slump, so I owe a lot to these projects. 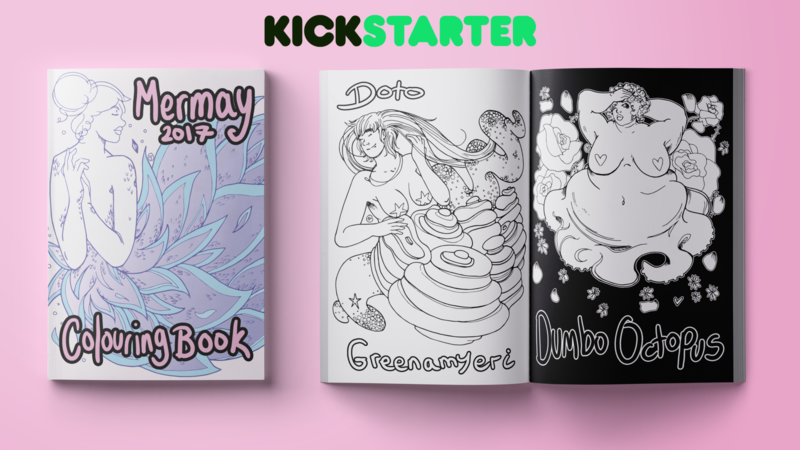 After chatting to some lovely artist friends I decided to use a Kickstarter launch as a pre-ordering system for the book. With Mermay I decided to make a list of creatures to base my designs on. You can see the full list here and here. The book is finished and ready to be sent to the printer, I just need your help in raising the funds to cover printing costs! I know not everyone can afford to buy the book. But, there are tip-jar options and just sharing the word would be super, super helpful. The aim is to have Kickstarter live from 16th June until 1st July. So keep an eye out and I’ll post a link soon! Five Things Friday is going on a short break whilst I focus on this project. But, do not fear, I’m still reaching out to a lot of artists and it will return soon!